WASHINGTON (CN) – Highlighting risks that a Donald Trump presidency adds to economic-growth forecasts, Janet Yellen told Congress on Thursday that she has no plans to let the next administration’s hostility toward her force her resignation as chair of the Federal Reserve. “From our point of view we don’t know what’s going to happen, there’s a great deal of uncertainty,” Yellen told the Joint Economic Committee. The chairwoman’s appearance this morning for the regular update on the nation’s economic outlook marks her first since Trump’s election. Questions about the president-elect, who has long accused Yellen and the Federal Reserve of keeping interest rates low to benefit the Obama administration, dominated the conversation. Though not one to speak in absolutes, Yellen was emphatic Thursday about the harm the economy could face if conservatives make good on threats to increase congressional oversight of the Federal Reserve. Yellen said she has no plans to step down before her term as chair of the board of governors of the Federal Reserve expires in January 2018. Yellen said the Trump administration’s policy prescriptions, as well as the actions Congress might take on those proposals, are still unclear and it could take some time for their impact on the economy to come into enough focus for the Fed to act on them. 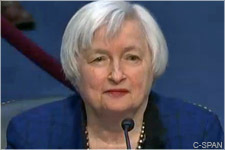 “Obviously there are many economic policies that Congress and the administration will be considering in the months and years to come and when there is greater clarity about the economic policies that might be put into effect, the committee will have to factor those assessments of their impacts on employment and inflation and perhaps adjust our outlook depending on what happens, ” Yellen said. The Dodd-Frank Act, which Trump has repeatedly criticized and vowed to roll back, was an especially prominent talking point during the two-hour hearing. Yellen assured Congress that the protections contained in the legislation are important safeguards against fiscal crises like the one that spurred the great recession in 208. “I certainly wouldn’t’ want to see all of the improvements that we’ve put in place, I wouldn’t want to see the clock turn back on those because I do think they’re important in diminishing the odds of another financial crisis,” Yellen said. But Sen. Mike Lee, R-Utah, criticized policies that put stricter regulations on the financial sector as hurting small banks and having the unintended consequence of consolidating market influence in a few large institutions. “I think it’s worth evaluating what an increasingly concentrated and potentially less competitive banking sector might pose,” Lee said.